A stunning copper effect tree water feature. It creates a relaxing atmosphere in any garden. It stands 104cm tall and include pump. No digging required, simply fill with water and enjoy! Water flows through the branches of the copper tree and drips into the self contained base below. The water is the recycled to the top of the tree. Please note that some splashing may occur. Autumn Copper Cascade Water Feature - customer reviews. 13 Nov 2014 Autumn Copper Cascade Water Feature Absolutely delighted with my water feature ,such good quality and value for money .Looks much posher than the price ! 30 Sep 2014 Autumn Copper Cascade Water Feature Just as described, worked 1st time with no problems and looks great. 4 Sep 2014 Autumn Copper Cascade Water Feature Looks good in the garden. 9 Jun 2014 Autumn Copper Cascade Water Feature Thank god the water feature was much better than there so called customer service. 7 May 2014 Autumn Copper Cascade Water Feature lovely, just want we wanted and looks classy I added my own extra crystal rocks for the water to run over . 22 Sep 2013 Autumn Copper Cascade Water Feature Great service...sensible packaging. easy to assemble. 28 Aug 2013 Autumn Copper Cascade Water Feature Really pleased with the water feature. Easy to install. Looks great. "Bought as solar feature. I love it!" "Fast delivery, quality product. A1!" "Not produced from real copper, but for the price it's a big feature and good value. Would use water features 2 go again." "Bought when on offer, for size it's amazing value for money!" "Thanks for prompt delivery, looks lovely in garden, a real focal point." 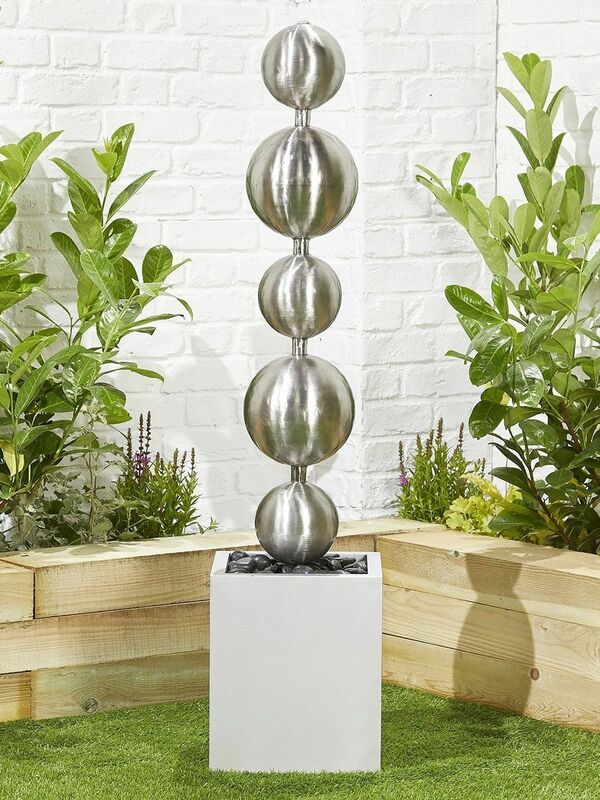 "Fits into my contemporary garden well. Like the shape as it really relaxes me liistening to the trickling water. Good price too!" "spot on, solar option with light is boss at night"
"Lovely feature. Excellent price, very fast delivery." "Hi, Just want to say thanks for your wonderful service with my recent order. I sent in my order at 14:50 on the 31 July and received my water feature around 12:00 on the 1 August less than 24 hours at standard rate postage Excellent!!!! I thought I had to wait for a retired Yorkshireman on an ex GPO bike with wenselydale cheese and Hovis sandwiches, a couple of tins of Yorkshire Bitter followed by his whippet to peddle down to Somerset with it strapped to his back. THAT GUY CAN PEDDLE!!!! It took me longer to install it than to receive it WELL DONE I was delighted with my purchase and would recommend your company to anyone looking for a similar product. Pictures of feature attached, use if like on web site Thanks again." "looks great and Very good price"
"Ordered tues received wed lunch.it is absolutely lovely.it didnt take me half an hour to put together, probably easier if there had been pictures.looks beautiful with the sun shining on it.very happy with purchase and service"